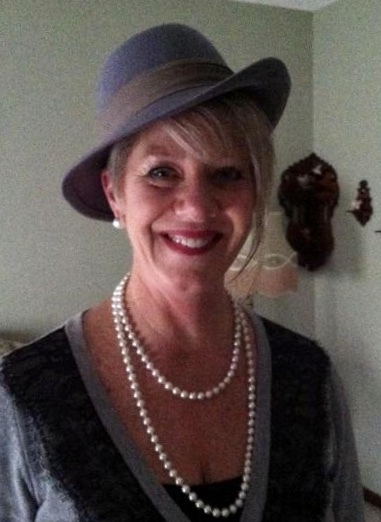 Vicky Sue Carey, 60 of Prospect, died peacefully early Monday morning April 8, 2019 at her home following a 10-month battle with cancer. She was born December 12, 1958 in Marion to Carroll Clair “Pickle” and Geraldine M. “Gerry” White. Vicky was a 1977 graduate of the Elgin High School. She was a lifelong dedicated member of the Prospect Baptist Church. Vicky had a strong faith and enjoyed the evening Bible Studies, she was also known to enjoy wearing hats to church. She had worked at the Marion City Waste Water Treatment Plant for over 20 years, before that she had worked for Delaware County. She was a member of the George L. Behrens #504 O.E.S., Delaware. Vicky enjoyed sewing, ballroom dancing and walking her beloved dogs, Nalla and Bella. She always appreciated the Prospect Fourth of July celebration; this is where she and Rick had their first date. Vicky’s family was the center of her life, her husband, kids, sisters, mom and her cherished grandchildren were what kept her going. The family was able to have a wonderful celebration last Saturday with Vicky, singing hymns, reading scriptures and just enjoying Vicky. Funeral services will be held Saturday April 13, 2019 at 11:00 am at the Prospect Baptist Church, Pastors Deb Moreland and Bill Snyder will officiate, burial will follow in the Prospect Cemetery, there will be an O.E.S. service preceding the funeral service at the church. Friends may call Friday from 4-8 pm at the Stofcheck-Ballinger Funeral Home in Richwood. I am so very sorry for your loss. Vicky was so fortunate to have such a loving and supportive family. My thoughts are with all of you. Our heartfelt condolences to Rick and all the family. Vicki was a sweet soul and will forever be remembered in our hearts. Deeply saddened to hear about Vicky's loss. I have such fond memories of her smiling and laughing walking around and about Prospect. My thoughts and prayers are with you all and wonderful peace knowing that we will all see her again someday! We are so sorry for your loss Rick and family. Vicky was just the sweetest. You are all in our prayers. I was blessed to get to know Vicky over the last few years. She was one of the nicest people I have ever met. Condolences to all of her family and friends. She will truly be missed. She lived on the same street as our family did she would come to our house many times to visit or to just talk and swing in our porch swing. I will miss her . May God bless you with warm thoughts and memories as he receives this beautiful believer into his kingdom. Vicky was known for her warm smile, gentle laugh, and love of family and friends. Thoughts and prayers are with you all at this time of mourning. Vicky and I grew up together in Prospect. We went to different schools but were together for Bible School and the pool. for your family! Sending prayers to you Debbie and Tammi and your Mom. We cannot express how sorry we are for all the family. We’ve lost a bright light but she will continue to glow in the hearts and memories of the hundreds of people whose lives Vicky has touched. May God give strength and comfort for the times ahead. There just aren't words to express your heartache. Vicky was such a caring person. Anyone who knew her will surely miss her. I know I will. My condolences to all of you. I can see from her smile and sweet face she looks very much like her mother. So young, but pray her love for all of you will surround you and be felt by you every day to comfort you. Rick and family, Our Heart goes out to you and your family. Vicki was a dear lady, and always was a kind soul. Hugs and prayers are with you. Gerry and Debbie, I am so sorry for your loss. Please know that you and your families are in my prayers. It is with great sadness that I share in your loss. A beautiful woman of God who joyfully now is in the arms of Jesus. And so it is, for the Christian family when one of us is called Home. We mourn from the emptiness in our heart; and yet we rejoice in the Hope we have in Christ. Will we, as Christians, grieve? Oh yes; but the Promise of God helps us to endure. God bless each of you and please know that I continue to lift you to the Throne of Grace. Gerry and family. May God give you his strength and love as you mourn the loss of Vicky. My heart goes out to each of you today. May you find comfort in your precious memories. Sending prayers and condolences for Vicki’s family and friends. May she Rest In Peace. I am very saddened to hear about Vick's passing. I am also very confident that she is rejoicing in Heaven now. I have known Vicky all of my life, as part of the Prospect Baptist Church. She was always full of fun and was a wonderful human being. I will miss her. My deepest sympathies go to Rick, Gerry, and all of her family. God Bless you. So sorry to hear of Vickie’s passing. She was always smiling. Prayers for the family. So sorry to hear of Vicky’s passing. Paul and I are praying for the family and rejoicing that Vicky is home with her Lord, healed and whole. Vicky was a champion of families. She loved her Husband, Children and Grand Children. She loved her Sisters and their families. She loved her Mother and Father. She loved her extended family, Grand Parents and Aunts, Uncles and Cousins. She loved her church families and work families. She loved everybody and God loves her. Vickie was always so kind and welcoming at church. She made me and my kids feel like family. My prayers hugs and love to her family. Prayers for all. Know that Vicky is at peace with her Lord and Savior. May you each treasure your memories. May God be with you at this difficult time and the days to follow. We are so sorry for your loss. Your family is in our hearts and prayers during this difficult time. God bless you. We were sorry to hear of Vicky ‘s passing. Our deepest sympathies to you and your family. Our deepest sympathy to the Carey family. So sad to hear of Vickie's passing. She was always kind, funny, and a pleasant person to be around. I am blessed that I had the opportunity to grow in Prospect and got to know all of the White family. A good, caring, and well thought of family. Vickie will remain in the hearts of all of those she touched..
Gerry and family so sorry to hear to loss of your daughter,wife,mother and grandmother. You have my deepest sympathy. Lynn and I wish to extend our deepest sympathy to you Rick and your family. Vickie was a beautiful lady. Prayers are being said for you and your family. God Bless! #35 Private Log in to view. So sorry for your loss. I remember some fun times we shared in HS. She will be greatly missed. May Gof wrap his arms around you and give you peace. Sending our love and prayers. Our sincerest sympathy to all of Vicky’s family. Sorry to hear for your loss. Thoughts and prayers for the family. Rick I am here if you need anything. My deepest sympathy for your family. I have wonderful memories of our trips with the Marion Seniors, to New York City and The New England Fall Foliage trips. Gerry, thinking of you at this sad time. We used to see one another at Carlyle's in Richwood on Fridays when my sister, my cousin,and I would lunch with our Aunt Ruby. Those were happier times. Sadly those days are gone. May God walk with you on this unpleasant path. Vicky was a very nice person. She will be missed. May God be with the family always. Vicky’s family. Our prayers are with you. May God comfort you. We had so much fun working with Vicky in the community church play. A great person.